If you’re serious about your chocolate, then Easter is probably one of your favourite times of the year. Chocolate is everywhere. You go to the supermarket to buy some bits for dinner and find yourself stood at the Easter egg display with just no idea how you got there (or so you say). We have Easter eggs as they are a symbol of new life, but originally, eating eggs was not allowed by church leaders during the week leading up to Easter. Consequently, they were developed into chocolate versions way back in the 19th Century. Over a kilo of chocolate comes together in this lovely little presentation box. 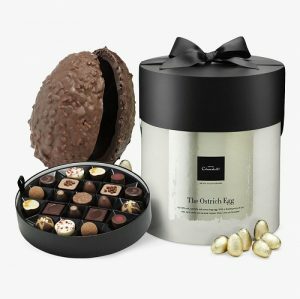 You get the all-important egg, as well as a tray of some of Hotel Chocolat’s most loved recipes. The perfect present (or treat for yourself, of course). They love gin as much as they love chocolate, so this little bundle of a traditional egg and a 50cl bottle serving will be well-received all round. There are plenty of other flavours available, too. It will probably all be eaten before they see the designs even if you tell them to go easy, but still. If you want something a little different, it is the perfect alternative to the traditional egg shape. Ideal for something a little different taste wise. This milk and white chocolate strawberry flavoured egg has a fizzy finish, and there is also a selection of milk, dark, pink strawberry & Marc de Champagne truffles. Plus it is one of the prettiest available, almost too good to crack open in fact. Classic design, classic plain chocolate and from a name synonymous with making very good sweet treats. They will still have something a little bit special if they aren’t fussed about fancy designs. Dairy-free, vegan-friendly egg filled with buttons. And it has a brilliantly punny name which we love just as much. All the eggs needed for the trail, and a present for the winner. If you have a lot of kids to entertain (big or little), then it’ll mean less effort for you. ome people much prefer candy as opposed to chocolate, and these sweets are egg-shaped, so the idea is there, but there is not a drop of chocolate in sight. Some people don’t like chocolate or sweets, and those who don’t likely love cheese. If this is indeed the case, this condiment package will be the perfect accompaniment to their next savoury snack night.